World Soccer Cup 2014: Which national team is going to claim victory? 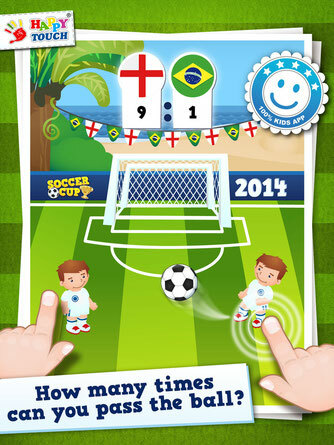 TODAY on iTunes available: THE Kids Game for the WORLD SOCCER CUP 2014! Let's get excited for the next matches! Your skills are put to the test: How many times can you pass the ball from player to player? It's just like the events in Brazil: from qualifying over k.o. rounds to the finals... the challenge increases! Let's see! May your results serve as an oracle for the soccer matches in Brazil? Even adults love to achieve new high scores! Do you have a spam problem on this blog; I also am a blogger, and I was wanting to know your situation; we have developed some nice practices and we are looking to swap techniques with other folks, please shoot me an email if interested. Magnificent website. A lot of helpful info here. I'm sending it to a few buddies ans also sharing in delicious. And certainly, thank you in your sweat! Thanks for one's marvelous posting! I certainly enjoyed reading it, you could be a great author.I will ensure that I bookmark your blog and may come back in the foreseeable future. I want to encourage yourself to continue your great work, have a nice afternoon! Hello to all, how is everything, I think every one is getting more from this site, and your views are pleasant in favor of new people. Hi Dear, are you really visiting this site regularly, if so then you will definitely get fastidious knowledge. Pretty nice post. I just stumbled upon your blog and wished to say that I have truly enjoyed surfing around your blog posts. In any case I'll be subscribing to your feed and I hope you write again very soon! This paragraph will assist the internet visitors for creating new weblog or even a weblog from start to end. I'm extremely impressed with your writing skills as well as with the layout on your weblog. Is this a paid theme or did you modify it yourself? Anyway keep up the nice quality writing, it's rare to see a nice blog like this one nowadays. Yesterday, while I was at work, my sister stole my apple ipad and tested to see if it can survive a twenty five foot drop, just so she can be a youtube sensation. My iPad is now destroyed and she has 83 views. I know this is completely off topic but I had to share it with someone! It is the best time to make some plans for the longer term and it's time to be happy. I've read this put up and if I may just I desire to recommend you some attention-grabbing things or suggestions. Perhaps you can write subsequent articles referring to this article. I want to read even more things about it!